Using high resolution satellite imagery to monitor animals from space was in the news this week. We’ve written about this application of remote sensing before, but this time we’re looking at new techniques for monitoring whales and mosquitoes! A team from the British Antarctic Survey (BAS) and the University of Cambridge published the paper ‘Whales from space: Four mysticete species described using new VHR satellite imagery’ by Cubaynes et al, in the Marine Mammal Science Journal on the 27th October. This paper was also presented at the Wavelength 2018 conference earlier this year, which Chris Doyle from Pixalytics attended. The presentation delivered by Hannah Cubaynes was an interesting preview of their work and it went on to receive an award for the best oral presentation. Counting whales from space has had limited success to date, the difference with this approach is the spatial resolution of the imagery that allowed the researchers to see the flippers and tails of whales, enabling them to differentiate four different species of whale: southern right whales, humpback whales, fin whales and grey whales. Using WorldView-3 imagery, from Maxar Technologies’ DigitalGlobe, gave a resolution of 31 cm for the panchromatic band and 1.24 m for the multispectral bands; and at 31 cm a grey whale’s tail occupies up to 10 pixels. The team used both panchromatic and colour pan-sharpened images of where these whales gather around the world. Experienced observers helped to manually determine which objects on the images were whales based on characteristics of body length and width, flipper length and tail width, alongside surface and near surface water disturbances for each species. 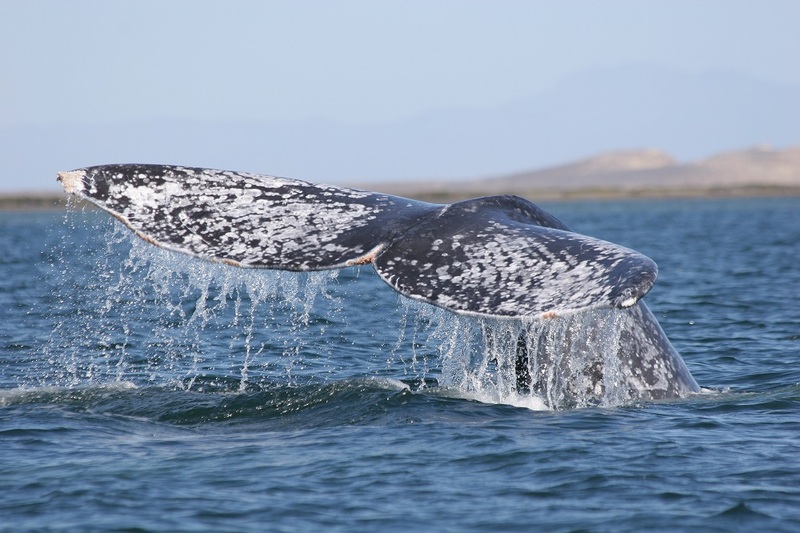 They identified 211 whale-like objects in an area of almost 5,500 square kilometres, with whales from all four of their chosen species, although the Fin and grey whales were easier to identify due to their body colouration, which contrasts with surrounding water. Humpback whales and southern right whales are a much more similar colour to the water, making them harder to pick out. Next the team are going to perform an audit of fin whales in the Ligurian Sea, part of the Mediterranean, and they know that they need to turn this methodology into an automated machine learning algorithm to improve the speed of processing. Overall, it offers great potential as whales travel huge distances and so using satellites enables the researchers to monitor a much wider area, quicker and more cost effectively than from boats or planes. Monitoring a much smaller creature, like a mosquito, is a much harder thing. However, using satellite imagery could offer similar advantages in terms of speed and cost-effectiveness; which could be hugely beneficial given the danger to humans of the diseases they can carry. Again this is not something new, for example, researchers at Aberystwyth University have used remote sensing, hydrological modelling and GIS to map malaria habitats. In this case, the Texas Department of State Health Services have turned to high resolution satellite imagery to help them to try and identify hotspots for disease bearing mosquitoes. The State Health Services laboratory in Austin offers local counties the opportunity to have mosquitoes tested for various diseases – in particularly the Culex and Aedes species of mosquitoes. Despite this being a free service only around 20% of the counties capture, and send, mosquitoes in for testing; the process takes several days. The laboratory does thousands of tests per year, but only around 1% of the samples positive for diseases such as West Nile fever. Where positive tests occur action can be taken and the pubic warned, but limited resources are behind the low numbers of samples submitted. A collaboration between Harris County, the Baylor College of Medicine in Houston and the ExxonMobile Foundation is using remote sensing to try and determine whether you can anticipate areas of likely disease. Sarah Gunter from Baylor College of Medicine has used high resolution imagery to develop a predictive model for the potential hotspots of Aedes and Culex mosquitoes using multiband imagery, including infrared, to develop information about vegetation growth and water that are both important for mosquito breeding. Based on this model, the Harris County Mosquito and Vector Control Division placed traps in three locations chosen by the research team to test how accurate the model’s predications were. There will be another round of testing next summer, before results are released, but success could herald a new approach to monitoring the habitats of disease-carrying insects. These two cutting edge research projects demonstrate the potential societal benefits that can be achieved through satellite remote sensing. This entry was posted in Data, Earth Observation, Oceans, Remote Sensing, Research, Satellite, Space Can Help, Space Industry and tagged Aedes, Baylor College of Medicine, British Antarctic Survey, Cubaynes et al, Culex, DigitalGlobe, ExxonMobile Foundation, fin, grey, Harris Country, High resolution satellite imagery, humpback, laboratory testing, Marine Mammal Science, mosquitoes, pansharpened, remote sensing, satellite, southern right, Space, spatial resolution, Texas Department of State Health Services, University of Cambridge, whales by Andy. Bookmark the permalink.